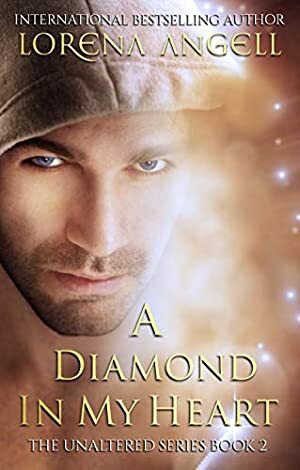 A Diamond in My Heart, book two in The Unaltered series, follows teen-aged Calli Courtnae as she learns how to control her new cosmic superpowers. She's afraid she's no match for some of the other people who are showing up with different paranormal powers, including a time-rewinding teen who apparently has some romantic fantasy about her going on in his head. She faces more challenges with him as he attempts to save the day. A #1 bestseller in eleven countries, with over 225,000 downloads, the Unaltered series' readers have shown their love with over 1,200 5-star reviews. The tale woven is one that feels ensconced in today's world alongside a huge dose of superpowers. Currently being optioned for film and television, so don't miss your chance to read this exciting series before it hits the screen. Log In to track Lorena Angell on eReaderIQ. to be notified each time the price drops on any book by Lorena Angell. to stop tracking Lorena Angell. The price of this book has changed 23 times in the past 2,239 days. The current price of this book is $0.99 last checked 22 hours ago. The highest price to date was $4.99 last reached on August 5, 2015. We last verified the price of this book about 22 hours ago. At that time, the price was $0.99. This price is subject to change. The price displayed on the Amazon.com website at the time of purchase is the price you will pay for this book. Please confirm the price before making any purchases.